Based on the New Living Translation, the Cornerstone Biblical Commentary equips pastors, and laypeople with a commentary that focuses on the theological meaning of the text in light of thorough exegetical analysis. This is not a technical commentary, but a commentary that puts to use what is gleaned from a thorough analysis of the text so that it can be appropriated by the church. 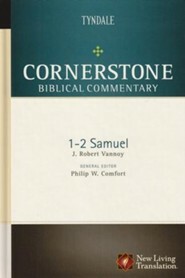 As such, this is an excellent commentary for use in churches, or for personal home study. It is relevant and scholalrly informed by geared for the non-academic. In this volume, covering 1-2Samuel Robert Vannoy does a splendid job bringing the two books to life and making them relevant for today's church. I'm the author/artist and I want to review 1-2 Samuel - eBook.